I love this cute punch art owl that I found online and decided to add him to a Valentine card for my class last month. Every month I have a class at the local university and their mascot is an owl so it was a perfect card for them too. I used the You Plus Me Bundle – which includes the Stamp set and the Designer Paper Stack. Plus the new Happy Hearts Embossing folder. Be sure to do your stamping before you emboss so it will be flat on your card. The eyes on the owl and the heart are both popped up on Stampin’ Dimensionals and then the whole owl is popped up with Stampin’ Dimensionals on the front of the card. A fun cute valentine card! Animal Talk is one of the sets in our annual catalog that I really like. I love the animals and what they are saying. But I’m sad to say it is on the retired list. This fun card was one I received last year at convention as a swap from Shanae Nay. She created a punch art frog and paired it with the Animal Talk stamp set for a cute card. I used this as a card for my Welcome Spring class earlier this month. The front of the card is actually a pocket and the frog itself slides in like a book mark – you could take him out and use him elsewhere. Afternoon Picnic Designer Series paper (retiring) and a strip of Basic Gray embossed with the Needlepoint Embossing folder (retiring). The tag is the Hexagon Punch and the Six-sided Sampler stamp set along with the Animal Talk little frog. Drag the edge of the hexagon in the ink to add color on the edge. To color the Baker’s Twine use a Stampin’ Sponge to hold the Whisper White Baker’s Twine into the ink pad while you pull it through. Animal Talk stamp set (retiring) was used to stamp the background and on the frog on the tag. There are many retiring items on this card – I’m going to come back later and fill in with a list of everything used. 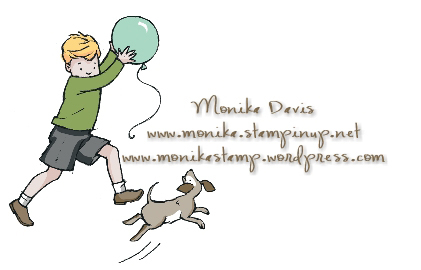 Right now I’m leaving for the day for Stampin’ Up! business. Going to join a focus group prior to dinner with 24 of my demonstrator friends and then the catalog premiere in the theater tonight!! These are fun little treats for Easter that you can make with just a bunch of your punches. I’m working on a bunch of them this morning to put out on my tables for tomorrow. I’ll have 29 here for Easter lunch – 25 are family and 4 are family friends. Only 2 younger ones that will be hunting eggs – they will have a bunch – I filled up all the plastic eggs that I had in my Easter stuff. I use the multi purpose liquid glue and my tiny craft tweezers to assemble. When Skies are Gray like today you need a little pick me and this little card might be just the right thing! We have had pouring rain ALL day so it is a very gray day here at my house. Everyone is home – no golf for Greg today. I was sort of waiting to post this card on a rainy day and I guess this is it. This card was part of my Sale-A-Bration class last month. I have seen many people make the sunshine using the little Banner Punch – this is my version. I went with a Summer Starfruit colored sun – I used the Sweet Sorbet Designer Paper for the center of the sun and then used the Banner punch to make the sun rays. Here is a tip for how I added the rays to the circle – think of a compass and add one banner at North, East, South and West. Then fill in between each of those with two banners. That was the easiest way for me to get them somewhat evenly spaced around the circle. One of the many cards that I saw with this sunshine idea included clouds made from the Cupcake Punch! What a great idea – I’ve actually used that before – remember the stamp set with the hot air balloons from last year – I added clouds to that one. But sometimes you forget until someone triggers you. My clouds are Smoky Slate on this card. The stamp image is from the See Ya Later stamp set. I used Stampin’ Write Markers to color the stamp, but also stamped the large Happy in the Summer Starfruit so it could be cut out and popped up. You make me HAPPY when skies are gray. What a nice thing to say! Inside there is a white circle and I stamped “Enjoy” also from the Oh, Goodie! stamp set. Just a tip on making the card base – go ahead and cut a standard size card base and score it – fold the card and place it so the scalloped circle cuts near the edge of the cut side of the card and the folded side doesn’t get cut because it is inside the die. I guess I should have taken a picture of that. Hopefully it makes sense.